Pea Starch Market size was estimated over USD 165 million in 2017 and the industry will grow by a CAGR of more than 20% up to 2025. 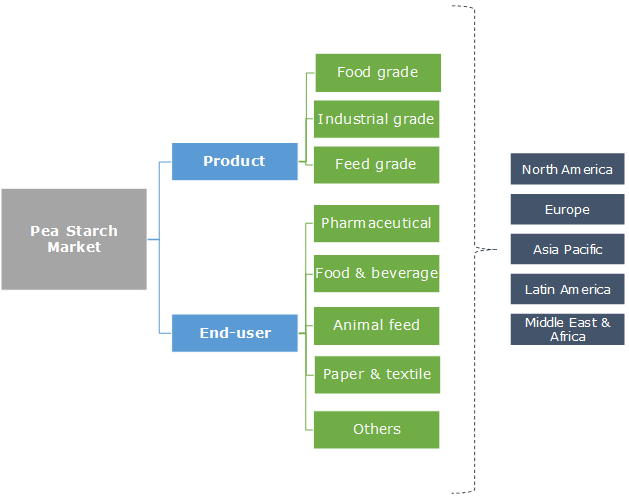 The global pea starch market will be primarily driven by its advantages over products obtained from other conventional sources such as maize, corn, rice, potato, etc. Dry peas have a high starch content of around 48%, whereas rice, corn, and potatoes, which are some of the most popularly used sources, have a content of approximately 28%, 19%, and 18% respectively. The product also has a high concentration of amylose, which is one of the two starch types recognized around the world. This unique feature imparts comparatively better thickening and gelling properties in the final product, making it an ideal ingredient for food products that require short and elastic texture. Its higher amylose content gives it greater stability under high heat, shear, and acid conditions than is typical of other products. These unique properties will boost product demand for use in food applications and will augment the global market growth during the forecast timeframe. Lack of awareness among consumers about the products superior properties and benefits will be a major factor hindering the pea starch market growth. Low product demand owing to lack of awareness has been compounded by the prevalence of other products in the market, such as those obtained from potato, maize, and corn. These factors may hamper the market growth during the forecast timeframe. However, with increasing acceptability of the product across the food additive processing industry coupled with rising marketing initiatives by manufacturers will increase consumer awareness and help in the industry growth in coming years. The global market has been segmented, based on product, into food grade, industry grade, and feed grade. Food grade is the largest product segment which will grow by a CAGR of around 24% during the forecast timeframe. This product type is suitable for human consumption, and as such are of better quality than the other two product types. Food grade product type is used in food & beverage as well as pharmaceutical applications and requires a range of certifications such as British Retail Consortium (BRC), Food & Drug Administration (FDA), KOSHER, Halal, etc. Industry grade product type held a minimal share of less than 10% of the overall market in 2017. This product is used in end-user industries such as paper, textile, adhesives, and cosmetics as a bonding, strengthening, or sizing & stiffening agent. Developments in the global cosmetics industry coupled with growing popularity of starch-based adhesives in the packaging industry will drive this segment’s growth in coming years. The global market is segmented, based on end-users, into pharmaceutical, food & beverage, animal feed, paper & textiles, and other niche end-users such as cosmetics, adhesives, etc. Food & beverage is the largest end-user segment which is expected to grow by more than 24% CAGR during the forecast timeframe. The product is extensively used in food & beverage items such as confectionary, coating, dairy, pasta, bakery products, snacks, potato products, soups & sauces, meat, poultry, fish, etc. as a thickening and binding agent. Pharmaceuticals end-user segment held a share of around 5% of the overall market in 2017. This is one such end-user segment where dedicated research in the future will open up new opportunities for product usage. At present, the product is used as an excipient, tablet superdisintegrant, controlled release polymer, and plasma volume expander in the pharmaceutical sector. High growth in the global pharmaceutical industry will augment this segment’s development during the forecast timeframe. The global market has been led by Asia Pacific, accounting for more than one-third of the industry in 2017. High consumption volume of noodles in China, Japan, South Korea, and Singapore will be a major factor behind the region’s leading industry position, as the product is extensively used in making noodles and vermicelli. 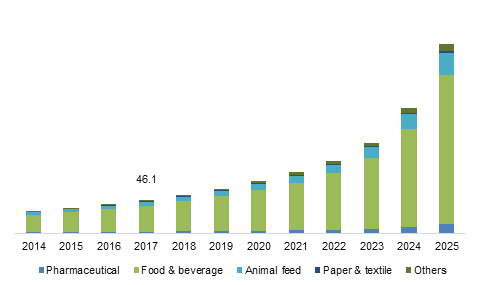 High growth in the Asia Pacific food & beverage industry coupled with increasing demand for animal feed in the region will also be major factors behind the pea starch market development in this region. North America is also a major pea starch market which will gain by a CAGR of more than 28% during the forecast timeframe. Increasing consumption of processed food in the region coupled with developments in the animal feed industry will propel the regional market in coming years. Awareness among the regional population about the benefits of healthy eating habits have resulted in a rise in cooking at home, using natural ingredients and the expansion of online platforms for recipe ideas. These factors will also drive product demand in the forecast timeframe for use in food items such as confectionary, bakery products, snacks, etc. Key market participants in the global market includes Roquette Freres, Cosucra-Groupe, Emsland-Starke, Vestkorn Milling, Parrheim Foods, Meelunie B.V., AGT Food and Ingredients, and American Key Products. Other industry players include Yantai Oriental Protein Tech Company, Shandong Jianyuan Bioengineering, Dakota Dry Bean, The Scoular Company, etc. The global pea starch market is consolidated with key market participants accounting for a major share of the overall industry. Roquette is the leader in the pea starch market with offices and sales networks in more than 100 countries around the globe. The company’s new pea processing site in Manitoba, Canada which is slated to start operation by 2019, will help it in maintaining their industry leading position during the forecast timeframe. Pea has been consumed as a food source for a long time in human history. Its availability in almost all regions of the globe has made it one of the most popular pulse around the globe. However, its processing to obtain starch is not very prevalent in the industry as other conventional sources are more commonly used. The product’s advantages over starch obtained from other sources provides ample opportunity for the market growth in the future. High cultivation volume of peas across the globe will also be a favorable factor, as raw material will be easily available for processing.